Idea – We produce gas from residues. We perceive waste as a raw material. Due to that the patented and new ecoloop technology approaches the challenges with an economic and ecological solution creating a previously unsurpassed level in the production of gas from residual materials. ecoloop is Unding a new innovative counterflow gasifier which allows for the conversion of carbonaceous materials into purified syngas. This Syngas can be thermally, electrically or chemically utilised. Inside the counterflow gasifier different carbon carriers are converted into syngas by adding lime (as carrier and binding agent for harmful substances). Due to the process and in contrast to other common incineration processes, no organic harmful substances such as dioxin or furan are produced. 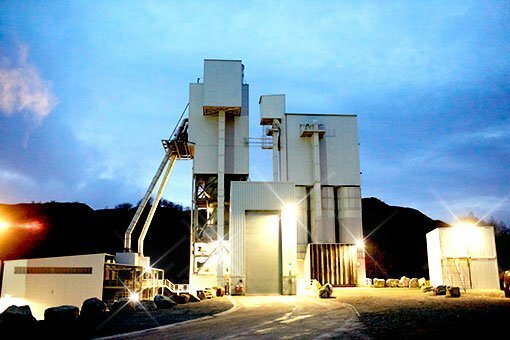 The ability of the lime to bind large amounts of harmful substances is the basis for an environmentally friendly thermal recycling. Acidic pollutants such as hydrochloric acid are immediately bond to the lime. After purification, the syngas is directly available for thermal or material utilization or power generation. The entire process is a closed efficient and economical system – the so-called ecoloop. 1. The input material is mixed in with the lime before getting into the hot reactor zones. 2. The material is moved by its own gravity and controlled by a rotary table discharge. 3. After the gasification in the upper pyrolysis zone, the remaining pyrolysis coke moves into the firing zone generating energy for the process. 4. 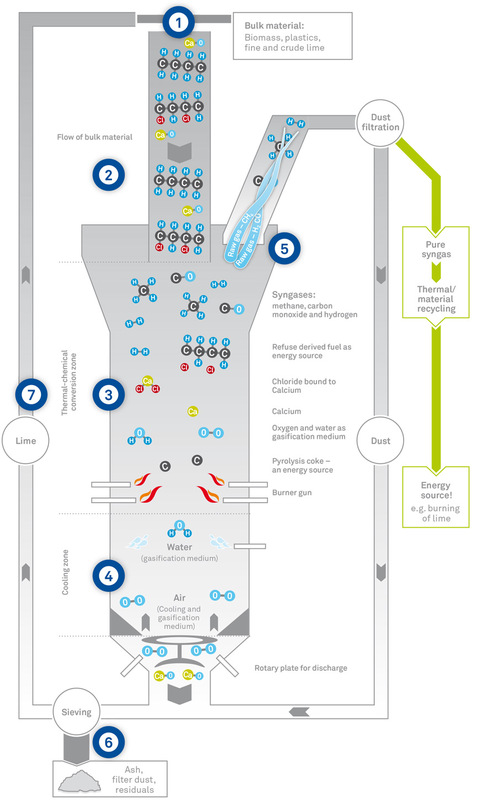 In the cooling zone, the lime is cooled down by the gasification agents air and water while the heated gasification agents contribute to the energy efficiency of the process. 5. Syngas is extracted at the upper reactor head whereby the harmful substances are bond to the fine lime. 6. Harmful substances are sieved out with the fine lime and ash. 7. Crude lime is returned to the process. 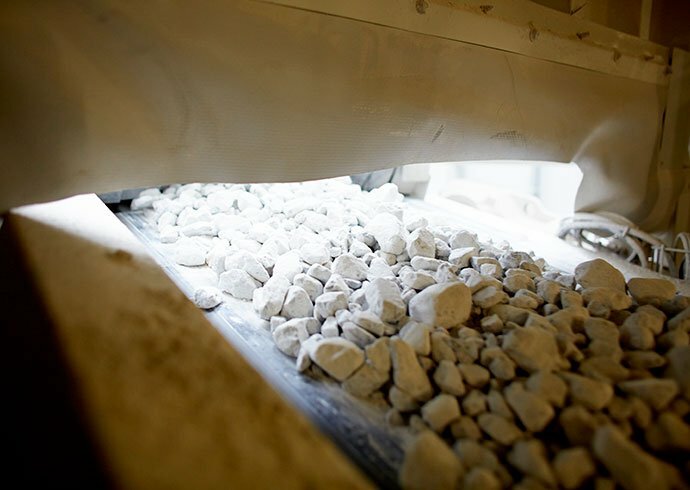 The material is transported only by its own gravity in a crude material moving bed of lime and RDFs – this makes susceptible moving equipment within hot reactor zones absolet. Lime acts as a multi-functional key in the ecoloop process. It serves as a transport medium for the fuel and provides support inside the moving bed. The catalytic effect increases the process-related development of syngas. In addition, the lime absorbs chlorine and prevents the formation of dioxin and furan. Energy is not released into the environment but kept inside the process. This results in a high thermal efficiency of more than 80 percent. Since there is no hot discharge of slag, possible damage of plant components and energy loss is avoided. ecoloop is capable of recycling very different waste materials in an efficient manner. Thanks to the lime that binds harmful substances it is possible to use even highly problematic substances with high chlorine content and there is no upper limit for the heat value. 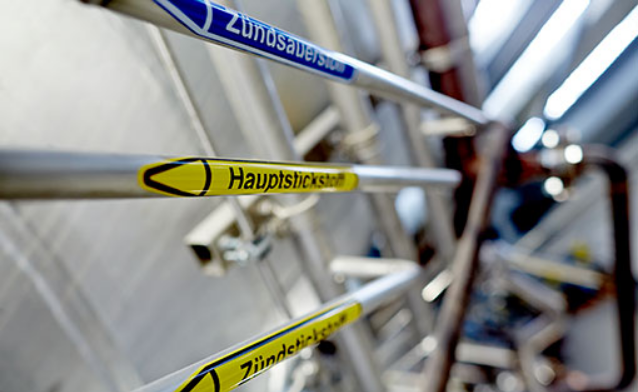 Depending on the customer’s requirements on gas quality the flexible use of different input materials is possible. Do you generate these kinds of waste or other residuals and are you interested in how they can be used in the ecoloop process? We would be more than happy to give you more information! The syngas generated in the ecoloop process is comparable with town gas or coke oven gas. 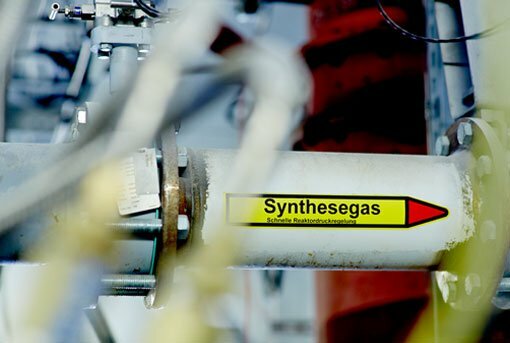 The quality of the syngas allows generating power in gas engines or the complete substitution of natural gas, coal or oil in thermal applications. The further use of the gas as a chemical resource depends on the input materials as well as the operation mode of the ecoloop reactor and will be examined in individual cases for the specific applications. The ecoloop technology can be realised at plants of different sizes up to 32 MW thermal output. This maximum can be increased through modular construction. ecoloop considers the generation of power as an essential extension of the use of ground-breaking technology. By using gas engines according to the state-of-the-art, it is already possible to achieve an electrical efficiency of more than 35 percent. 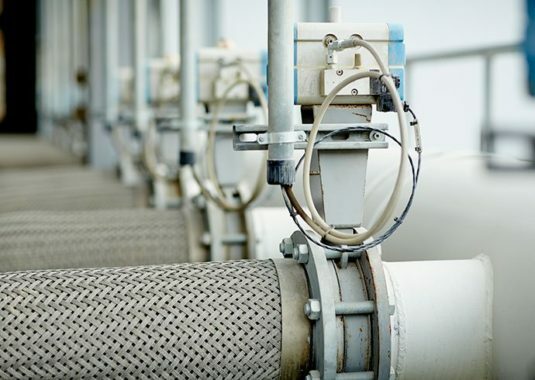 Compared with other power generation applications from waste materials, ecoloop can thus offer a higher electrical efficiency together with a higher resource and energy efficiency. The generated power can be used on one´s owm or it can be applied to the public power grit.